After more than 60 years of operation, the run-of-river hydropower plant Porąbka in southern Poland required a comprehensive upgrade. The aged steel penstocks and discharge pipelines were replaced with Flowtite GRP pipes and fittings by Amiblu. The hydropower plant Porąbka is located at the river Soła in southern Poland and features a 260 m long dam which forms Międzybrodzkie Lake. It is equipped with two Kaplan water turbines and one Francis turbine that generate in a total capacity of 12.5 MW. 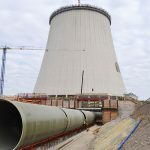 Since 1953, when the power plant launched operations, water has been supplied to the turbines via three steel pipelines, two DN 3250 and one DN 1000. These pipelines were renovated in 1995/96 but still showed technical defects. It was therefore decided that the power plant required a thorough upgrade. Ekologiczne Projekty Energetyczne MADEX from Zielona Góra developed comprehensive renovation plans. In September 2016, the investor PGE Energia Odnawialna S.A. launched a tender for the works, including the replacement of pipelines supplying water to the turbines, the installation of new butterfly valves, the construction of new drainage pipelines, and the reconstruction of existing and construction of new concrete structures. All upgrade works were scheduled to be completed in November 2018. After thorough considerations and analyses, the investor decided to upgrade the power plant using Flowtite GRP pipes. 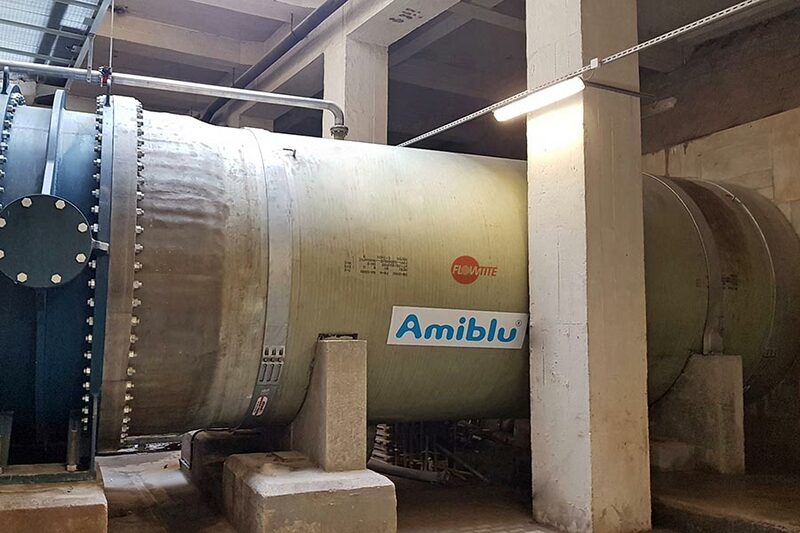 Amiblu Poland offered pipes that met all specified requirements: They are resistant to burst pressure and corrosion and feature a high long-term stiffness. The works started in January 2017 and had to be carried out while the hydroelectric plant remained in operation. Therefore, it was necessary to proceed in such a way that at least one water turbine was always running. Penstock renovation works were divided into three stages. Stages 1 and 3 included the delivery of the largest pipes and fittings (DN 3300, SN 5000, PN 6). The inner diameter of these pipes had to be adjusted to the diameter of the butterfly valve of 3280 mm. Amiblu designed and supplied pipes of 6.45 m length, two angular fittings, and two fixed flange stubs, which were cut to their required length and laminated directly on site by the Amiblu expert team. The connection of GRP pipes and fittings to the existing steel pipe and reinforced concrete wall was a challenge for the designer and the contractor. It was solved by using epoxy resin laminate at the GRP/steel connection, and steel pins for stabilising and anchoring the fittings in the reinforced concrete wall. Eighteen clamps for anchoring the steel pins were laminated over the whole circumference of the GRP fittings. In addition, the surface of the GRP pipe was sanded for sealing the joint over a width of 55 cm and ultimately ensuring complete tightness. The greatest challenge during stages 1 and 3 was the installation of a pipe section DN 3300 which involved enlarging the openings in the building’s roof and then precisely lowering the pipe to the foundation on new reinforced concrete supports. The Amiblu staff laminated the drain, circulation, and metering connections to the GRP pipe. They also installed a specially designed fixed flange DN 600 for mounting the inspection opening, which should disturb neither the flow of water to the water turbine nor the flow measurement results. The single pipe sections DN 3300 were connected with Straub mechanical couplings, which allow for an easy disassembly of the system in the future. The second stage of the project involved the supply of GRP pipes and fittings with an internal diameter of exactly 1000 mm. Flowtite pipes can be manufactured with a precise inner diameter (according to the European Standard PN-EN 14364). This stage also included lamination works to the water turbine. In October 2018, the discharge system consisting of GRP pipes and biaxial fittings DN 250 was assembled. Twenty special shapes with loose flanges were installed between the single water turbine units. In November 2018, the last turbine unit eventually restarted operations. All in all, the installation of Flowtite pipes was carried out in two weeks. The use of GRP pipes will allow the Porąbka Hydro Power Plant to safely produce green energy over the next decades. Client: PGE Energia Odnawialna S.A.